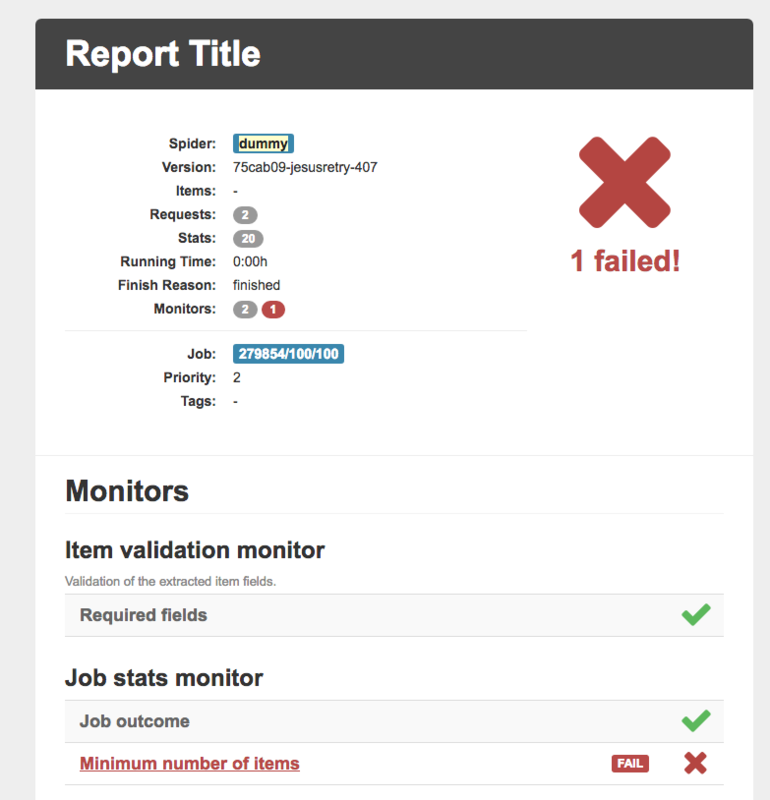 By default, when a monitor suite finishes, the pass/fail information is included in the spider logs, which would be enough during development but useless when you are monitoring several spiders. Spidermon allows you to define actions that are ran after the monitors finishes. You can define your own actions or use one of the existing built-in actions. By default, Spidermon uses a HTML template that can be altered in SPIDERMON_BODY_HTML_TEMPLATE setting. You can use Jinja2 as your template engine. You can also define actions for when your monitors fails or passes also including actions to the lists monitors_passed_actions and monitors_failed_actions . Address of the sender of the e-mail notification. List of all recipients of the e-mail notification. If set True , the e-mail content will be in the logs but no e-mail will be sent. List of recipients of the message. It could be a channel or an user. If set True , the Slack message content will be in the logs but nothing will be sent. If you are running your spider using the Scrapy Cloud you are able to include tags in your jobs. 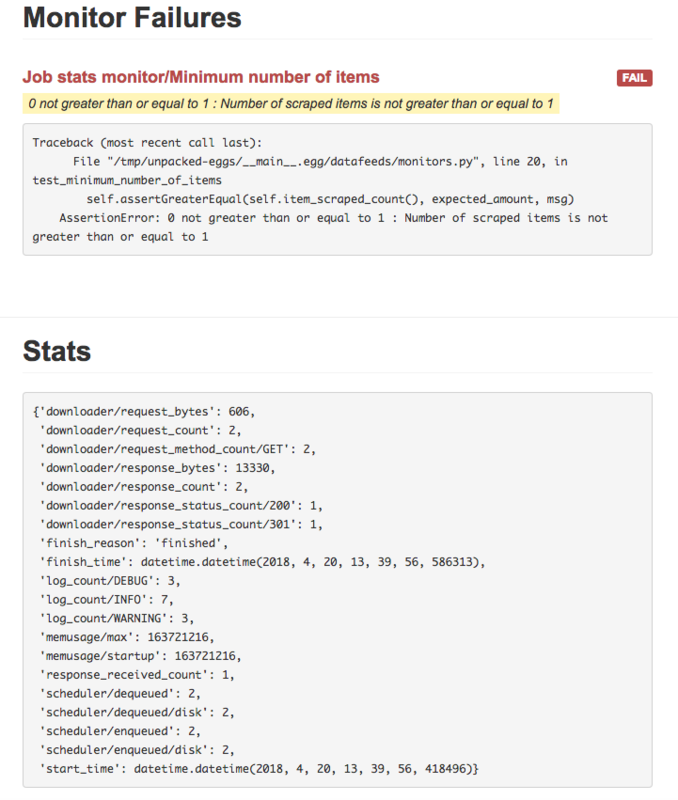 Spidermon includes two actions that may be used to add or to remove tags to your jobs depending on the result of the monitoring. In this example, considering that you defined a running tag when you start the job in Scrapy Cloud, if the job passes without errors, it will remove this tag. If the job fails the failed tag will be added to the job so you can easily look for failed jobs. List of tags to be included when AddJobTags is executed. List of tags to be removed when RemoveJobTags is executed. This action allows to create a file report based on a template. As E-mail action you can use Jinja2 as your template engine. Dictionary containing context variables to be included in your report. String containing the path of the generated report file. String containing the location of the template for the file report. This action works exactly like File Report action but instead of saving the generated report locally, it uploads it to a S3 Amazon Bucket. Data Source Name provided by Sentry, it’s a representation of the configuration required by the Sentry SDKs. Project name to use in notification title. Environment type to use in notification title. It could be set to anything like local, staging, development or production. If set True , the Sentry message will be in the logs but nothing will be sent. 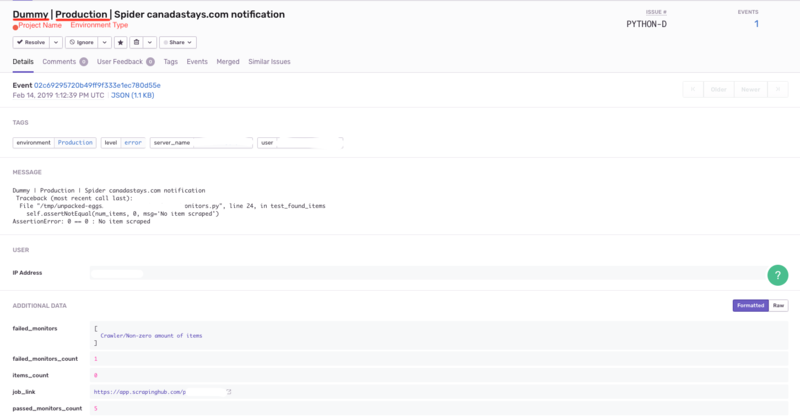 You can define your own custom actions to be executed by your monitor suites. Just create a class that inherits from spidermon.core.actions.Action and implement the run_action method.